According to some, today is the day when the world is going to be saved. Not sure if I agree with that, but recognise that the inauguration of Barack Obama is of some importance :-)). And, naturally, so is the work carried out by mysociety.org. I therefore thought today would be a good time to point to some of its achievements in 2008. So where to begin? Well, personally I think the work with the Commuting Time Maps is worth mentioning. Developed in collaboration with the Department of Transport it enables users to work out commuting distances from one point to another. This is arguably very useful information if you are house hunting, looking for a new office or if you are an estate agent wanting to provide clients with that extra information. Or how about picking up an award for FixMyStreet at the SustainIT eWell-Being Awards. The judges said it was “[a]n excellent example of an independent website which empowers the general public in their dealings with their local council. It is a relatively simple application, yet highly effective and replicable.” Very well done indeed. I know I have mentioned it before, but an obvious achievement is for the charity to have stayed alive and kicking for five years. The main man behind mySociety.org, Tom Steinberg, was around the time of the anniversary featured in an article in the Guardian. Check it out for some more in-depth information about Tom and the rise of mySociety.org! Full details of all the achievements and general ongoings in 2008 can be found on the blog, especially the successes and 2008 pages. From one extreme to another – the diversity among mySociety’s volunteers is most fascinating. You may, or may not, have read one of my previous blog posts on Tim Morley, a volunteer responsible for the day to day running of pledgebank.com. If you have, you will know that he is a primary school language teacher who is making a massive contribution towards keeping that site going. It may be difficult to believe, and mySociety is ever so grateful for it, but there are actually other volunteers out there who are just as dedicated. One of them are Amandeep Rehlon – Treasurer as well as Trustee of UKCOD and Director of mySociety. Having a background in accounting and finance Amandeep is responsible for, among other things, VAT returns, annual accounts and paying staff. We all know that money makes the world go around, so quite a lot of responsibility there. 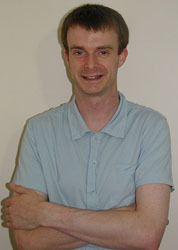 As dealing with finances at mySociety is not enough, he also does it in his “real” job working for the Bank of England. As he puts it himself, being based in the Financial Stability area he has been ‘ahem, rather busy in the last year or so’. Yeah, I can imagine! 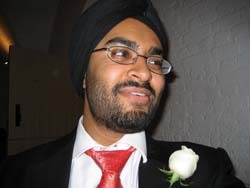 Amandeep originally got involved with mySociety in late 2005 as he was seen as a suitable replacement for Tom Loosemore, the previous Treasurer who left to due to family commitments. Three years or so later, he’s still around because he thinks ‘mySociety’s sites make the world a better place’ and (as with Tim Morley) he likes the people that he works with. Very encouraging to read that he also knows a lot of people who are using mySociety’s services in their day jobs – we would like to hear more of that! When he has some spare time (not sure when that would be but there you go) he plays hockey, read, listen to music (including lots of gigs) and eat too much chocolate – ‘especially from James’s chocolate shop’. Sounds like a full on life, but fortunately with a bit of fun in between. Felt inclined today to Google mySociety and came up with 746,000 search results. Not bad. Being a new volunteer with mySociety I was intrigued by reading about the organisation and its work from various angles, in newspaper articles, blogs and even seeing a couple of video clips. The word is out there so no need to take drastic measures like in the Charlie Brooker experiment! 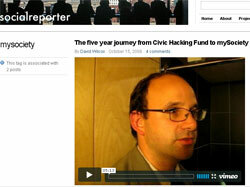 As you may know, mySociety recently celebrated its fifth birthday, something that made a few headlines. The ambition appears to be to keep on going for at least as many, finances permitting. I certainly hope that something can be worked out – real and potential work is a plentiful and output is making a difference from an e-democracy perspective. Tom (founder and director of mySociety) has already written a blog post about how to best use mySociety sites, the best way to get started is to … get in touch. If you are just interested in keeping an eye on what’s going on, there are numerous email alerts on all the sites with the possibility to sign up for keyword alerts. And of course to set up RSS-feeds.